When a governor like Pence decides to starve the public schools, many districts respond by early retiring their most experienced teachers and replacing them with young, inexperienced cheap hires. When there is a teacher shortage, they may not even be able to find many of these, so they instead turn to long-term substitutes and student teachers. These substitutes and student teachers can be paid at a rate that is cheaper than the union rate for a real teacher, even one who is fresh out of school. When an employer hires a nonunion laborer to avoid paying the wages negotiated with the union, that employer is hiring a scab, and that nonunion laborer is a scab. They undermine the negotiating power of the teachers’ unions, making it more difficult for teachers to earn a decent living. Because they make it more difficult for teachers to earn a decent living, they discourage people–especially talented people with other options–from entering the education profession, lowering both the quantity and quality of professional teachers, exacerbating shortages and lowering standards. This hurts kids. Now, what does Teach for America do? Teach for America offers recent college graduates the opportunity to teach for a two year period, usually in a school in a low income area. The students get to feel like they’re making a difference–they think they’re helping underprivileged youth. Meanwhile, the school districts get to avoid paying union rates, and the governors and state legislators get to avoid paying the political price of a prolonged teacher shortage. This helps the districts and the state governments engage in a race to the bottom to deprofessionalize and deunionize the teaching profession, and that means that it helps them reduce both the quantity and quality of professional teachers. By stepping in to fill a void, the students are making the void bigger. Of course, the students don’t realize that they’re being scabs. Nobody tells them that–instead, we congratulate them for trying to help poor kids. The students have good intentions, and they mean well, and the most talented among them might even do a good job individually in the short-term. But in the long-run, poor kids would be better off if they had professional teachers full-time, and they’d be better off if those professional teachers were well-compensated and highly skilled. This is one of those cases where the anecdotal experience of the individual TFA teachers leads us away from the deeper fact that the program as a whole contributes to the problems it attempts to solve. Teach for America’s teachers only get a few weeks of training. 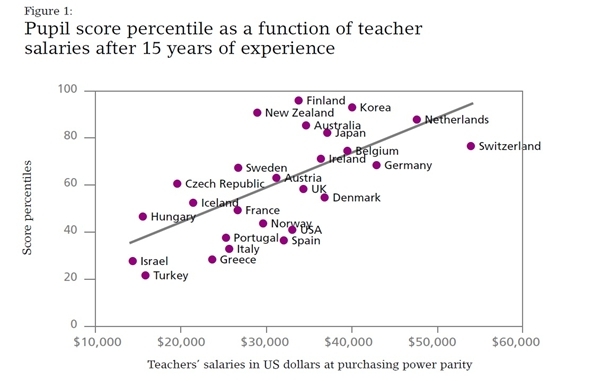 Even if the best ones are good, the average TFA teacher cannot be as good as the average experienced professional. Most don’t stick around–more than half leave at the end of their two year deals, and only 14.8% of TFA teachers remain at the school to which they were assigned after five years. This is not a long-term solution to teacher shortages and sliding standards. Yet state and federal governments continue to endorse this approach–under Pence, it became possible to get hired as a full-time teacher in Indiana with a bachelor’s degree in anything and a 3.0 GPA, and the Obama administration chucked millions of dollars in federal money at TFA. Suppose at some point, for whatever reason, the public schools deteriorate. Thereupon, increasing numbers of quality-education-conscious parents will send their children to private schools. This “exit” may occasion some impulse toward an improvement of the public schools; but here again this impulse is far less significant than the loss to the public schools of those member-customers who would be most motivated and determined to put up a fight against the deterioration if they did not have the alternative of the private schools. Scab teaching hurts the scab, it hurts the teaching profession, and it hurts the kids.